I’d heard that Jennifer Niven’s young adult debut was a good one but I wasn’t prepared for how much of a tearjerker it was. All The Bright Places is my kind of book: contemporary, super sweet romance, lots of deeper issues that take root in your mind and don’t let go. Is it any surprise that I loved it? Theodore Finch is an odd boy. To be honest, I wasn’t sure I was going to like him at first. He was strange and kind of rude and just not very friendly. Then there was Violet who was pretty much a mean girl. She was pretty and popular and smart and funny. Basically she was the opposite of Finch. However, they did have something in common. They were both rather preoccupied with the thought of death. Theodore was a very depressed boy who liked to think of interesting ways to die. He not only thought of ways that he might die, he also researched the statistics surrounding those types of deaths. He was kind of morbid. As for Violet, her sister was killed in a car accident and ever since then she hasn’t been able to stop thinking about death. She refuses to get in a car, she doesn’t think much about moving on with her life, and she can’t help but feel that her sister’s death was her fault. That connection brought her and Finch together but there was so much more that kept them together. The story focuses a lot on depression. It’s pretty clear from the start that Finch suffers from depression and maybe some other condition but that isn’t made known. It’s impossible not to feel for him. However, it’s not depression or death that bring Finch and Violet closer together. It’s the crazy project their teacher gives them that does it. They have to visit wonders of their state and chronicle their time at each place. They are only required to visit 3 places but Finch and Violet take it even further, attempting to visit every wonder of Indiana that they can find. It’s this project that brings Violet out of her shell and brings her and Theodore together. The story itself isn’t exactly fast-paced and that is probably my only issue with All The Bright Places. I found my attention being drawn by other things and it took me a while to really feel invested in the story. I will admit that the first 50 to 75 pages are a little boring and almost made me give up completely. I’m definitely glad I didn’t but the thought did cross my mind. 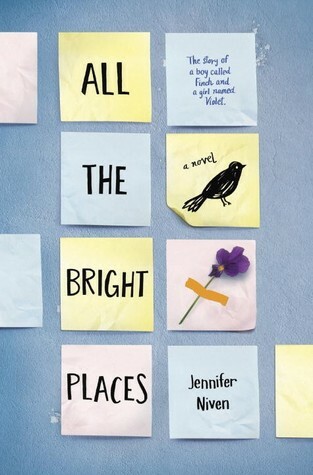 Overall, All The Bright Places has me eager to read more young adult novels from Jennifer Niven. I found myself laughing and crying all throughout this book and it definitely left me smiling at the end. I LOVED this book!! It was so great. Like you, I had a little trouble connecting with Theodore at first. But I soon fell in love with him. I stayed up one night until 2am reading it and I was sobbing into my pillow. Ha. I have heard so many good things about this book and I must say your review just added to my enthusiasm of reading this. The whole deep issues tear-jerker aspect of this boon sounds exactly like my thing. I have a copy of this already, so I don’t know why I am prolonging it – so many books, so little time. I’m glad you didn’t give up on reading this book. Apart from the chemistry between Finch and Violet, the main theme of the book that makes me ponder is depression and the tendency to kill oneself. There are times we may read news about a teenage who killed himself/herself because of depression or any other reasons. And there might be one around us that we are not aware of. This book actually alerted us to give more concern on those surrounding us. They might be suffering in deep depression but they’re good in hiding it. Listen while we can. I’ve heard good things about this book, but it concerns me slightly that it took you so many pages to get hooked. It won’t stop me from reading the book, but 50-75 pages is a long for a book to hook a reader. I firmly believe a book needs to hook the reader within the first couple of pages.